Adenoid cystic carcinoma (ACC) is one of the common salivary gland malignancies affecting mainly the major salivary glands, seen in fourth to sixth decade of life with slight female predilection. They show a high recurrence rates, metastasis, and a tendency for perineural invasion. Trop2 is a cell surface glycoprotein belonging to the TACSTD gene family. This protein was initially found to be highly expressed in trophoblast cells. Trop2 is believed to be an oncogenic cell membrane glycoprotein that plays an important role in tumour growth. Trop2 has been found to be a reliable prognostic marker for a variety of epithelial cancers. Trop2 antigen expression in colorectal, pancreatic, gastric, and squamous cell carcinomas of the oral cavity was shown to correlate with tumor aggressiveness and poor prognosis. These findings indicate the potential role of Trop2 in tumor development and progression. As a consequence of its wide distribution in epithelial tumours, Trop2 seems to be an attractive structure as a possible immunotherapeutic target. There are very few studies evaluating Trop2 expression in head and neck malignancies. Hence, the current study is designed to evaluate the expression of Trop2 in ACC and correlate with prognosis. The study material consisted of four cases of ACC. Formalin-fixed paraffin-embedded blocks of all the cases were retrieved from the archives of the Department of Oral and Maxillofacial Pathology, Saveetha University between the years 2010 and 2012. The diagnosis was confirmed based on histopathological examination of hematoxylin- and eosin-stained sections. For immunohistochemical study, 3 μm sections were cut from formalin-fixed paraffin-embedded blocks, mounted on gelatin-coated slides. The sections were deparaffinized in xylene, dehydrated in alcohol, and rinse in distilled water. Antigen retrieval was performed using heat induced-epitope retrieval in citrate buffer (pH 6.0) for 10 min in a pressure cooker. Following which, endogenous peroxidase was blocked for 5 min, protein block for 5 min. Section were then incubated for Trop2 (Rabbit polyclonal to TACD2 abcam, Cambridge, USA) and incubated for 60 min. Detection was performed using Novolink Min Polymer Detection System (Leica Microsystems, Newcastle, UK). 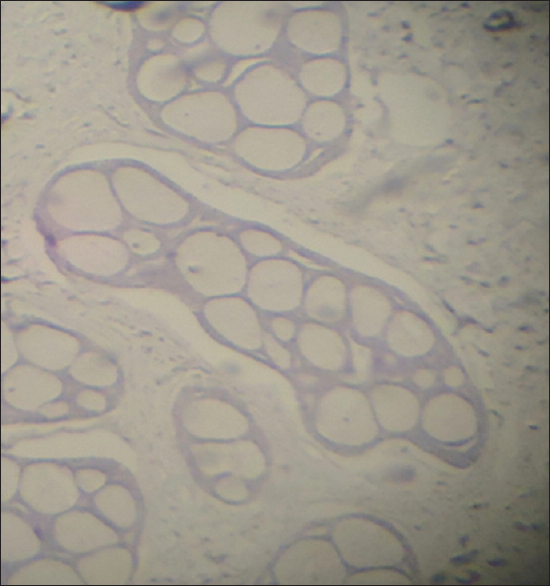 The sections were then counterstained with Mayer's hematoxylin. The slides were then dehydrated and mounted. Negative and positive controls were used in each run. Negative controls were achieved by performing the staining procedures with omission of the primary antibody. Presence of brown-colored end product at the site of target antigen was indicative of positive reactivity. The brown staining of cell membrane and the cytoplasm of the tumor cells was considered as positive expression of Trop2. The immunohistochemical-stained sections were analyzed by two independent observers. The extent of interobserver agreement was analyzed on a kappa scale. Trop2 expression was evaluated for each tissue sample combining the scores of proportionality and intensity of staining. Intensity of staining was recorded as mild, moderate, and severe. Proportionality index was scored based on the focal or diffuse expression of Trop2. Localization of the antigen expression to the membrane and cytoplasm of the tumor cells was also evaluated. Combining the scores of intensity index and proportionality index, the overall expression of TROP2 was graded. A total of 4 cases of ACC were evaluated for Trop2 expression. The staining for Trop2 was negative in all the cases of ACC [Figure 1]. The results are summarized in [Table 1]. Trop2 is a cell surface glycoprotein belonging to the TACSTD gene family. This protein was initially found to be highly expressed in trophoblast cells. Trop2 is believed to be an oncogenic cell membrane glycoprotein that plays an important role in tumor growth. However, its exact function in tumor biology is yet to be explored. On reviewing the literature, there were two different schools of thoughts as of the role played by Trop2 in carcinogenesis. Several studies have shown that increased expression of Trop2 in colorectal, gastric, oral, and pancreatic cancer is associated with tumor aggressiveness and a poor survival rate., Recent studies ,,,, have highlighted the relevance of Trop2 as a marker of tumor aggressiveness and poor prognosis. There are a few studies where loss of Trop2 expression has been associated with poor prognosis. The current study was designed to study the role of Trop2 in ACC. In the present study, all the studied cases were negative for Trop2 expression. While previous studies have emphasized the potential prognostic importance of Trop2 gain of function, there remains a subset of carcinomas wherein loss of Trop2 expression-enhanced tumor formation and epithelial to mesenchymal transition mediated through mitogen-activated protein kinase and downregulation of E-cadherin expression. Comparable to the above study, Lin et al. demonstrated downregulation of Trop2 mRNA expression in adenocarcinomas of breast, kidney, lung, and prostate. The decreased Trop2 expression may hinder its suppressive effect on insulin-like growth factor-IR signaling potentially leading to invasion and metastasis. Based on this paradigm, the varied expression of Trop2 in different tumors connotes its diverse role in Carcinogenesis-being overexpressed in epithelial neoplasms and downregulated in glandular neoplasms. While gain of function of Trop2 has been much explained by the previous studies, the present study along with that of Wang et al. indicates that the loss of function of Trop2 has been associated with a poor prognosis. This is essential as researches that target Trop2 immunologically will need to take into account the effects of its loss of function. Moreover, the precise function of Trop2 has not been defined. It seems to be a molecule with varied functions. Identification of the other pathways that go hand in hand with Trop2 might help us to understand clearly its role in pathogenesis. Such studies might also throw more light on the varied expression pattern of Trop2 in different carcinomas. The current study is a maiden attempt to understand the role of Trop2 in ACC; however, a large sample size is required to establish its possible role in the pathogenesis of ACC and potential to act as a prognostic marker. Gates GA. Minor salivary gland tumors of the oral cavity. Otolaryngol Clin North Am 1972;5:283-9. Fong D, Spizzo G, Gostner JM, Gastl G, Moser P, Krammel C, et al. TROP2: A novel prognostic marker in squamous cell carcinoma of the oral cavity. Mod Pathol 2008;21:186-91. Ohmachi T, Tanaka F, Mimori K, Inoue H, Yanaga K, Mori M, et al. Clinical significance of TROP2 expression in colorectal cancer. Clin Cancer Res 2006;12:3057-63. Cubas R, Li M, Chen C, Yao Q. Trop2: A possible therapeutic target for late stage epithelial carcinomas. Biochim Biophys Acta 2009;1796:309-14. Mühlmann G, Spizzo G, Gostner J, Zitt M, Maier H, Moser P, et al. TROP2 expression as prognostic marker for gastric carcinoma. J Clin Pathol 2009;62:152-8. Nakashima K, Shimada H, Ochiai T, Kuboshima M, Kuroiwa N, Okazumi S, et al. Serological identification of TROP2 by recombinant cDNA expression cloning using sera of patients with esophageal squamous cell carcinoma. Int J Cancer 2004;112:1029-35. Wang J, Zhang K, Grabowska D, Li A, Dong Y, Day R, et al. Loss of trop2 promotes carcinogenesis and features of epithelial to mesenchymal transition in squamous cell carcinoma. Mol Cancer Res 2011;9:1686-95. Lin JC, Wu YY, Wu JY, Lin TC, Wu CT, Chang YL, et al. TROP2 is epigenetically inactivated and modulates IGF-1R signalling in lung adenocarcinoma. EMBO Mol Med 2012;4:472-85.